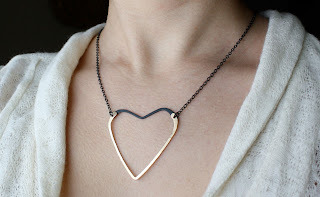 You got to know Kylie of Early Jewelry a little bit the other day, and now you have a chance to win one of her pieces! Here are the two beautiful items up for grabs: a gold-filled hammered wire and oxidized sterling silver heart necklace (retail $70) and a pair of asymmetrical geode earrings (retail $62). Two winners will be picked! To enter, leave a comment on this post. One comment per person, please. Open to international readers. Entries accepted until 11:00 p.m. Central Time on February 13th. Winners will be randomly selected and announced on Valentine's Day. Good luck! Also, if you want to get some cute earrings for a good cause, Early Jewelry is donating all of the profits from these $15 heart studs to the American Red Cross. ooh, my! both of those pieces are gorgeous! I especially love those earrings! Those are both lovely pieces! This would be a perfect way to celebrate and cheer up during my job-hunt! Oh wow, those are beautiful!! I would totally rock both those pieces! unfortunately my ears are not pierced but my sister would totally wear them, I love the necklace though! The necklace is great, but those earrings are absolutely amazing! Pretty! Who needs a valentine when you have cute jewelry. I love the necklace! How sweet and lovely! ode to a geode...i blowed all my dough, you know how it goes. I'm a huge fan of early jewelry. she just hits it on the nose every time. I would love to win some of her work! ooh! love both of those! Oh wow. I think those earrings were meant for me. I love the heart necklace. I so hope it's me!!! I adore that heart necklace! I love the little ones too, it is really nice to see all these people coming together and sending money to a cause. Making money for a cause is by far my greatest accomplishment in life. I love Early Jewelry! I live in Omaha, NE and I bought one of Kylie's horseshoe necklaces at a First Friday event. I ended up giving it to a good friend of mine because she loved it so much. I love Kansas Couture, too. Nothing like spreading the word that us Midwestern girls can be fashionistas, too! Stunning! The necklace in particular is so beautiful. i love the necklace! Thanks for the work you put into the blog, I'm inspired every time I read it. I love both pieces. The necklace is my favorite. So simple! So pretty.. Very cool that your having a giveaway! Beautiful pieces! I love the agate earrings! Both of these are so lovely! I especially like the earrings, particularly because of the asymmetry...not too often that I see lovely asymmetric statement earrings. Thank you for the chance to enter! wow, I love the necklace! Beautiful. Those earrings are particularly gorgeous! I just discovered Kansas Couture last week and already it's become my daily fix. I'm a petite, brunette copywriter from Toronto for whom your blog has been great inspiration. That necklace is perfect, I want. gorgeous! I love the heart necklace alot! Those geode earrings are so lovely! Both pieces are, but the geodes are particularly calling to me. I really love the heart necklace! These are great pieces. I would love to rock them. wow...so beautiful. it would really help my recent-breakup blues to get a valentine's present anyway! wow these are both so gorgeous! wow! these are all amazing! pick me! wow... those are amazing! I love both! ooh, pretty! pick me, pick me! Those earrings are insanely awesome! 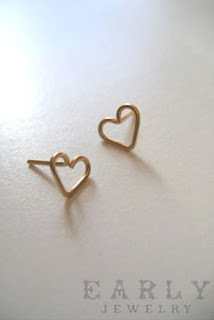 And I love that they're donating the profits from the little heart studs. A jewelry maker with... heart! those earrings are amazing! and the necklace is just as lovely! i'd love to wear those kansas beauties. really really cute count me in! What a really sweet giveaway! Excellent jewelry. The design is amazing. I would wear those earings so much! Beautiful pieces! I especially adore the necklace. I like that it's a short chain. i LOVE that heart necklace!!! oooh, those are both so cute. mememememe please! ok I'm a pisces, most romantic sign of the zodiac, my birthday is 2/20 and I'm hitting a major milestone year and would love to wear that gorgeous heart. Both of these pieces of jewelery are beautiful. One of my favorite things to do is to collect unique jewelery. Fleamarkets are a sure bet. I also like to collect jewelery , mostly gifts, from around the world (Russia, India, Costa Rica, Africa) I would be honored to receive one of these pieces of jewlery as would any girl. These are so unique! I love the asymmetrical earrings! Okay, I totally heart the heart necklace! Beautiful! And the geode earrings, totally wicked! That's it. I'm off to check out the rest of the shop! ps. your thrifting adventure totally inspired me and I went thrifting at 7 am this morning (also it was a sale. I had to). SUCH a gorgeous pair of earrings, and the necklace... stunning! The earrings are phenomenal! I love early Jewelry...nice to see a great local designer! I love the combination of a thin heart with a delicate chain! These are both so lovely! That necklace is absolutely lovely. What a great giveaway just in time for Valentine's Day. Thoose pieces are amazing! Happy early valentines day! love both of those but especially the necklace! That jewelry would totally make valentines day (my least favorite holiday) better! They are sooo pretty! I love them. I love the simple organic feel of Early. These earrings are more than fabulous! I SO adore those!! Fingers crossed!! Both the earrings and necklace are gorgeous. I would love to win either! i love everything! i am so glad ur posting more regularly now, i missed ur posts! I love these! i wouldn't know which to pick! That necklace is to die for!!! Oh wow, too gorgeous! I love the necklace! What absolutely stunning pieces! No better company on v-day but some beautiful jewelry! Great giveaway and those earrings are too precious. Oh!! I love that necklace!! Awesome jewelry!! I absolutely adore those little hearts! Both pieces are so pretty! I hope I get picked! The pieces are lovely, and so versatile! :D pick me pick me!! Pretty!! I love the earrings!! Wow. That necklace is amazing. I thought it couldn't get any better...then I saw the earrings! so adorable and perfect with everything! Oh my goodness, I absolutely adore both of these pieces (the geodes remind me of the Midwest, where I also live), but I especially love the delicacy of the necklace, which is equal parts sweet and tough. So cute! Both of these items are so creative & chic! I love them!! What a great eye for design! that necklace is gorgeous and so are the earrings. i would absolutely love to be the owner of either. loooooooooooooooooove love love those allllll! Oh my goodness...wow. That neckalce is stunning!I don't really have a great selection of jewlery. These pieces are georgeous, and something I would love to get my fourteen year old hands on. This is quite the oppurtunity, considering I have no consistent income whatsoever! They're just so...classy and gamine. Love it! i tried those earrings on at her trunk show last weekend and they are amazing... love both pieces, though! In love with those earrings! Wow! These are so artistic and beautiful. 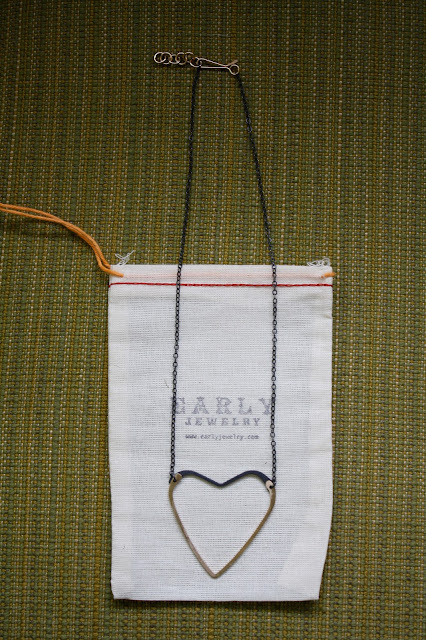 What a beautifully shaped heart necklace! Oh wow. I love both of these pieces so much. Love the jewelry & love your blog! I love both pieces but the earrings are my fav! Good luck to everyone! Ahh such amazing pieces! Hoping I win! i absolutely adore these pieces, especially the earrings. Love love love the asymmetry! Wow, I especially love the geode earrings, they're so original! The jewelry looks awesome! I love the necklace so much. Beautiful. Thanks for the giveaway! i love them both... especially the geodes!! These pieces are absolutely beautiful. Thanks for hosting the giveaway! It's Maggie from MN. I always loved seeing her pieces at First Fridays in KC and at Goldmakers too maybe? I love it! Hope you're staying warm! These are spectacular! Probably the best Valentine's Day gift I could imagine! The necklace is so delicate and pretty, and the earrings are funky and cool. Holy cow, awesome! The necklace AND the earrings are just brilliant! Ooh! The earrings and necklace are both lovely. These pieces are stunning! I love the organic feel behind them. I love that necklace and those heart earrings!!!! Those geode earrings are rocking my world! I love, love, love that heart! Hey, been following your blog (bookmarked it) since my first visit to What I Wore. I love Early Jewelry, especially these pieces! I would love to either, those earrings are beautiful! I absolutely love those earrings!!! AHHH, so cute! :) I can't resist, hehe. Ooooooooo, fab giveaway! Me please! Pretty please! ohh so beautiful! I love them all... an amazing giveaway indeed, hope I win! love love! hope to get into her shop soon! So cute! It would totally make for a great Valentines day present to a friend (or yourself). What a lovely heart earrings! Love them! Hello! I read your blog often at work...I admire your ability to take a vintage find and recycle it into something modern. Oh my! those earrings are just DIVINE! LOVE LOVE! I have been in love with geodes since I was a small child...winning those earrings would be a dream! Valentines Day is the perfect time to celebrate loving yourself. And those pieces I would love on myself :) You're great keep up the great posts! Saw you in the recent issue of Lucky Mag! my jewelry box needs some new life! ahh these are incredible! I love them so much! Beautiful Jewelry... I'm a sucker for hearts!